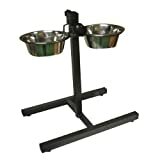 Raised dog bowls, often referred to as 'elevated dog bowls' are gaining in popularity as they come with their own advantages. Firstly, raised dog bowls are a great idea for large dogs. Large dog breeds are obviously taller than other and so have much further to reach down to their food and water than others. This can be uncomfortable and awkward. The same goes for dogs with muscle or joint problems like arthritis. Stretching down to a low bowl for food and water can not only be difficult, but also painful. This can be the same for elderly dogs too. A raised or elevated dog bowl can help reduce these stresses and strains. 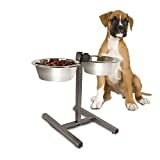 If you have a raised dog bowl for your canine friend, you can promote better posture when your dog is eating. If you have a big dog, see to it that it's spine is in line and not arching unnaturally. When they always have to bend down to reach the food, the spine is not in line and this can cause strain and damage later on in life. 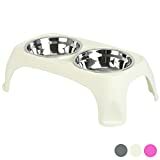 Your dog's digestive track will be even better when you have a raised dog bowl. Since your dog is eating at an elevated level, the food that they eat will get to their stomach faster which makes it easier to digest. Eliminate the strain in the forearms and waist area by getting a raised dog bowl. Usually, the shoulders and the hips of your dogs are the first parts affected when they get old. So avoid stress on these parts. When choosing a raised dog bowl, make sure you choose the right size. A big Labrador will still be hungry if it eats only enough food to fill a Chihuahua-sized portion! Also bear in mind what material you choose - whether it's plastic, ceramic or stainless steel. It's important to help ensure our dogs have a happy and fulfilling life. 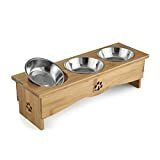 A raised dog bowl has great advantages and can help elderly or aching dogs eat and drink more comfortably.